This classic focal length with a moderate wide-angle perspective is perfectly suited for commercial, location and nature photography. The Distagon T* 2/35 is designed to provide very high image quality over a wide range of apertures and focusing ranges. The fast f/2 aperture enables hand-held photography under difficult lighting conditions and the short focus rotation is well-suited for fast action photography. The Distagon T* 2/35 is available with the F bayonet (ZF), K bayonet (ZK) and M42 (ZS) lens mounts and is designed for use with full-frame SLR and DSLR cameras. 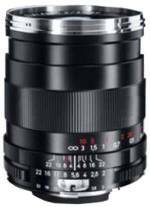 Combined with a DSLR with a 1.5 crop factor, the lens has an effective focal length of 53 mm and can be used as a standard focal length for a natural viewing perspective.